Shoeburyness (/ˌʃuːbəriˈnɛs/; also called Shoebury) is a town in southeast Essex, England, at the mouth of the Thames Estuary. It is within the borough of Southend-on-Sea, situated at its far east, around 3 miles (5 km) east of Southend town centre. 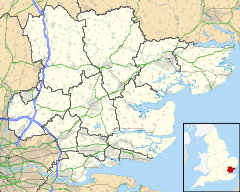 It was an urban district of Essex from 1894 to 1933, when it became part of the county borough of Southend-on-Sea. It was once a garrison town and still acts as host to MoD Shoeburyness. Auxiliary Territorial Service (ATS) girls at the Royal Artillery Experimental Unit, at Shoeburyness, using the Window Position Finder to sight shell bursts in the air or water, 1943. The eastern terminus of the London, Tilbury and Southend Railway (c2c line) is at Shoeburyness railway station, services run to London Fenchurch Street in the city of London. The eastern end of the A13 is at Shoeburyness. The MoD Shoeburyness site at Pig's Bay is situated nearby and the facility is run by the company QinetiQ. Shoeburyness has two beaches: East Beach and Shoebury Common Beach (also known as West Beach), both Blue Flag beaches. East Beach is a sandy/pebbly beach around a quarter of a mile long and is sandwiched between the Pig's Bay MoD site and the former Shoeburyness Artillery barracks. Access to the large gravel/grass pay-and-display car park is via Rampart Terrace. East Beach is the site of a defence boom, built in 1944, to prevent enemy shipping and submarines from accessing the River Thames. This replaced an earlier, similar boom built 100 yards (91 m) east. The majority of the boom was dismantled after the war, but around one mile still remains, stretching out into the Thames Estuary. East Beach benefits from a large grassy area immediately adjacent to the sands, which is suitable for informal sports and family fun. Shoeburyness is where, during the Second World War, a magnetic ground mine, which was deposited in the mud at the mouth of the Thames by the Luftwaffe, was discovered by the MoD. Up until that time, various sinkings of ships around the English coast were thought to be due to U-boat torpedoes. The discovery of the ground mine allowed countermeasures to be introduced to neutralise the weapon's effect; one of these was the degaussing cables installed in merchant ships in Allied and British fleets, and of course the wooden minesweepers. Shoebury Common Beach is bounded to the east by the land formerly occupied by the Shoeburyness Artillery barracks and continues into Jubilee Beach. Shoebury Common Beach is the site of many beach huts located on both the promenade and the beach. A Coast Guard watch tower at the eastern end of the beach keeps watch over the sands and mudflats while listening out for distress calls over the radio. A cycle path skirts around the sea-front linking the East Beach to Shoebury Common Beach, and thence into Southend and a number of other towns, including Leigh-on-Sea. The English painter J. M. W. Turner depicted the fishermen of Shoeburyness in his oil painting Shoeburyness Fishermen Hailing a Whitstable Hoy. The painting was exhibited in 1809, and was part of a series Turner made of the Thames estuary between 1808 and 1810. The painting has been in the collection of the National Gallery of Canada since 1939. In the fifth Temeraire novel Victory of Eagles, Shoeburyness is the setting of a fictitious climactic battle in which Wellesley and Nelson drive Napoleon out of England in early 1808. Shoeburyness is home to "the commuter", protagonist in the eponymous song and music video by Ceephax Acid Crew. Shoeburyness is mentioned in the Porridge episode "The Harder They Fall" (S2 E6), at approximately 6'10". ^ "Southend Ward population 2011". Retrieved 21 September 2015. ^ Shoeburyness UD Essex through time: Administrative history of Local Government District Archived 1 October 2007 at the Wayback Machine, visionofbritain.org.uk; accessed 18 November 2017. ^ "MOD Shoeburyness". Qinetiq. Retrieved 12 March 2016. ^ "Blue flags awarded to a dozen sunny Anglia beaches". ITV News. Retrieved 2017-05-31. ^ Gordon, Dee (2014-02-03). The Secret History of Southend-on-Sea. History Press. p. 84. ISBN 9780750955454. ^ Simpson, James (23 November 2014). "How Britain Beat Germany's Magnetic Sea Mines". War Is Boring. Retrieved 31 May 2017. ^ Shoeburyness Fishermen Hailing a Whitstable Hoy, before 1809, National Gallery of Canada website; retrieved 18 June 2013. ^ Shoeburyness Fisherman Hailing a Whitstable Hoy, tate.org.uk; retrieved 18 June 2013. ^ "The Temeraire Reread: Victory of Eagles". Tor.com. 18 May 2016. Retrieved 31 May 2017. ^ "The Commuter" by Ceephax Acid Crew (2010) on YouTube; accessed November 18, 2017. ^ "Shoeburyness Climatic Averages 1981–2010". Met Office. Retrieved 23 December 2012. Wikimedia Commons has media related to Shoeburyness. "Shoeburyness" . Encyclopædia Britannica. 24 (11th ed.). 1911.